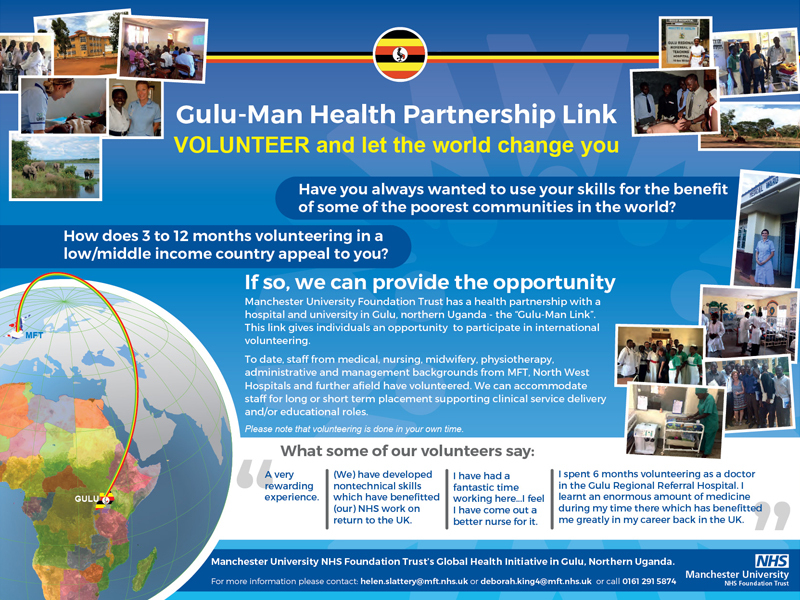 Global Health – the Gulu Manchester Link is an international health initiative, which is unique to North West. MFT, Wythenshawe site has a long-standing healthcare education link with the Faculty of Medicine at Gulu University and the Regional Referral Hospital in Gulu, Northern Uganda. This link gives health workers, students and academics at MFT and Ugandan institutions the opportunity to share skills and develop their learning through innovative ways. The programme also enables our staff and students to make practical contributions to health systems in low to middle income countries. To make a real difference to global health we depend on volunteers both from overseas and in the UK. Most overseas volunteers pay their own costs, rather than receiving funding from the NHS. To date, staff from medical, nursing, midwifery, physiotherapy, administrative and management backgrounds from MFT, North West hospitals and further afield have volunteered. 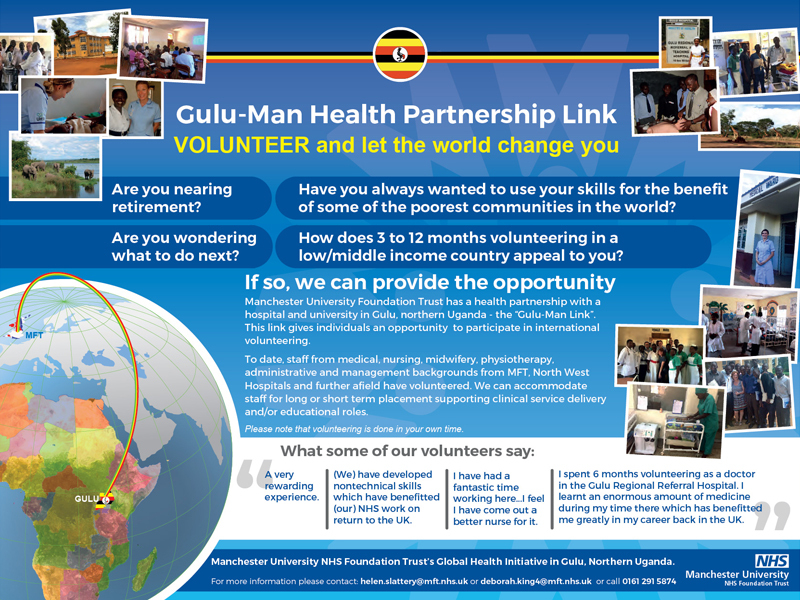 We have placed healthcare professionals for longer term roles, ranging from six months to a year, to deliver healthcare directly to people in Gulu. We facilitate shorter length trips for healthcare educators who deliver education and support and those undertaking research. You don’t have to work for MFT to volunteer for the programme overseas or help with fundraising here in the UK. For further information please contact Helen Slattery by emailing helen.slattery@MFT.nhs.uk or calling 0161 291 5874.